Upgrade Kit with Drive, Install Tools, + Envoy Pro for Easy Data Transfer/Original Drive Reuse: The Aura 6G SSD features industry leading SandForce® DuraClassTM Technologies: DuraWriteTM extends the endurance of your Solid State Drive (SSD). Intelligent Block Management & Wear Leveling automatically distributes data evenly across the entire SSD. Intelligent Read Disturb Management spreads the active read/write across the flash components eliminating data corruption caused by constant use. Intelligent "Recycling" for advanced free space management gradually re-writes data across the SSD over time to ensure data never gets corrupted. RAISETM (Redundant Array of Independent Silicon Elements) protects the data on your drive similar to having a RAID setup. Best-in-Class ECC Protection for longest data retention and drive life. 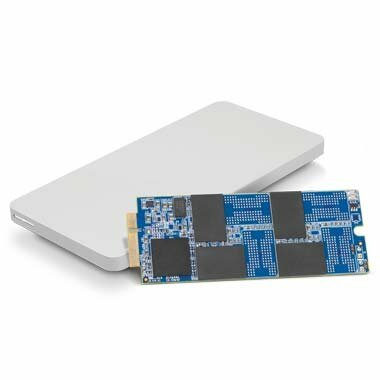 OWC provides Mac users the only Only Complete 2-in-1 Upgrade Solution that delivers higher performance, functionality, and reliability: Upgrade your rMBP's factory installed SSD with greater performance and capacity via the Aura. Retask the replaced factory SSD as a bus-powered, pocket-sized external storage solution via the Envoy Pro. When first introduced, the MacBook Pro with Retina display base model offered a 256GB SSD configuration with no upgrade option. Now, instead of being "factory locked", the OWC Aura 6G gives you the freedom to upgrade your capacity to meet your storage needs. Ultra-portable, bus-powered external storage solution designed to complement the MacBook Pro with Retina display. The OWC Envoy Pro combines elegance and functionality into a sleek, portable external storage solution that complements the design and finish of the MacBook® Pro with Retina display. Its anodized aluminum body protects your drive and data, while its minimal size allows for simple stowing in coat pockets, backpacks or briefcases. The USB 3.0 interface offers speedy transfer rates of up to 500MB/s and the Envoy Pro requires no AC power.